Privacy Tech | Wickr introduces secure group calling, video conferencing tool for the enterprise Related reading: IAPP FAQs: Are GDPR-compliant companies prepared for CCPA? Earlier this week, Privacy Tech discussed the various risks that email presents for individuals and the enterprise. Private-sector and political organizations have suffered the consequences of having private, internal discussions leaked for the world to see. Such implications prompted us to include an "Enterprise Communications" category in our Privacy Tech Vendor Report. But what about the privacy and security of those conference calls so many of us take part in on a daily basis? 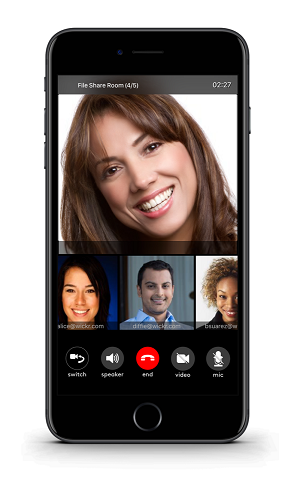 Secure messaging service Wickr has decided to take on that challenge with the release of a new beta version of a secure calling and video conferencing tool. 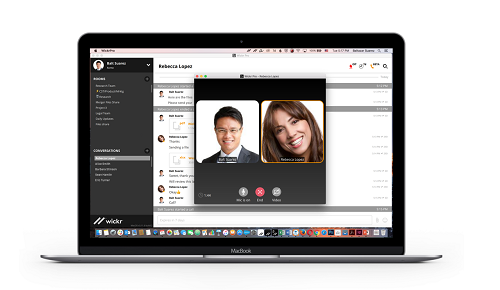 Layered on the company's messaging protocol, which is available for review on Github, Wickr Pro allows teams in one organization to host conference videos and calls to collaborate with partners in other organizations. "We put on our math hats and created a new and different encryption technique that allows us to offer secure voice and video," Wickr CEO Joel Wallenstrom said in a phone conversation with Privacy Tech. The communications use end-to-end encryption, and users do not have to fuss over managing secure keys since Wickr handles that on its messaging protocol. Wallenstrom said the technology can play a significant role in strategic board conversations involving mergers and acquisitions, corporate development and investigations. Though not meant to handle massive conversations involving hundreds or thousands of employees at once, Wickr's new tech is designed for strategic and high-stakes group conversations, something, Wallenstrom pointed out, many of Wickr's customers have been demanding for some time now. Secure group video and conference calling has not yet gone mainstream, in part, because of the amount of bandwidth and infrastructure needed to transmit video and calling data. Wallenstrom said scaling enterprise communications is difficult, but Wickr has decided to invest heavily in its back-end development and its customer support. "We're making a huge investment in the security of our product," he said. "It's a very difficult thing to do this at a group level in terms of back-end development. This is a significant commitment in terms of capital and people to get this right." Wickr's move to serve the business-to-business market comes after its initial splash in the consumer market as a one-to-one encrypted messaging application, something that came into consumer demand after the initial 2013 Snowden disclosures of U.S. government surveillance capabilities. It also already offers encrypted file-sharing capabilities through its technology for consumers and enterprises. Since Wickr's conference messaging service is layered on top of its original messaging application, its service can also be a bring-your-own-device solution. Risks around BYOD policies are nothing new to privacy professionals, whether we're talking smartphone use, web browsing or email communications. Wallenstrom said one of the largest requests he has seen from Wickr users is the ability to use its services for business and personal use without eroding corporate security or personal privacy. "We have to stay realistic that people are going to communicate outside of their specific network," Wallenstrom explained. He said Wickr has had conversations with privacy and compliance offices while developing its messaging technology, saying they are a critical component to the conversation. "We've found," he said, "that those who have an impact on information governance policies are the ones who get involved in the process because it has a lot to do with who can use it and what defense of data destruction policies are in place." Wickr's security development has been lauded by security professionals and just this week received high marks from the Electronic Frontier Foundation's 7th Annual "Who Has Your Back?" release. Wickr was one of nine companies that received all five stars from the digital rights group, which includes following industry best practices and disclosure to users of government access requests, among other considerations. The one caveat to Wickr's services is that all parties in a conversation must have Wickr's app installed on their devices or computers. Having Wickr on each side of a conversation allows for proper key management, for one. It's also important to remember that Wickr's group video and calling service is still in beta. Development of this technology is based on user demand, so Wickr is rolling out to those who have requested such capabilities. It's also looking for feedback from "various networks, geographies and devices." If you're interested in its group messaging technology, Wickr would like to hear from you.